Obituary for Stanley Milchovich | Thompson-Marodi Funeral Home, Inc.
Stanley “Nunnie” Milchovich, 83, of Ellsworth died Thursday morning, February 7, 2019 at the Washington Hospital. He was born July 10, 1935, a son of Chuck and Eathel Lundy Milchovich. He served with the U.S. Army during the Korean War and he was a member of Saint Katharine Drexel Parish. 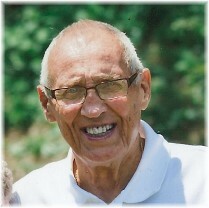 Mr. Milchovich was an educator in the Bentworth and Charleroi school districts, and he ended his career as the principal of Charleroi High School. He was active in sports and was involved in soccer, softball, baseball, football and basketball on the high school and college levels. He served in many coaching positions and was the assistant coach when Bentworth High School won the WPIAL basketball final. He was the athletic director at Charleroi schools, he officiated basketball for many years, and was a member of the WPIAL Board of Control and chairman of the WPIAL Soccer Committee. He ended his sports career in 2010 in the Over 70 Softball League. Mr. Milchovich was a member of the following hall of fames: Washington-Greene, Charleroi and Mid-Mon Valley, and he received the Michael Dudas Award from California University of Pennsylvania. Surviving are his wife of 53 years Rita Fabiszewski Milchovich; two children, Carol Jones (John) of Bentleyville and Stanley V. Milchovich of North Charleroi; two sisters, Helen Crafton of Stockdale and Ruth Sapko of New Stanton; a brother Tim Milchovich of Belle Vernon; and several nieces and nephews. Deceased is a brother Jamie Milchovich. Friends are welcome from 12 to 3 p.m. and 5 to 8 p.m. Sunday at the Thompson-Marodi Funeral Home, Inc., 809 Main Street, Bentleyville, 724-239-2255, where a prayer service will be held at 9:30 a.m. Monday, February 11, followed at 10 a.m. by a Mass of Christian Burial at Saint Katharine Drexel, Bentleyville Campus, 126 Church Street, Bentleyville with Reverend Edward L. Yuhas, as celebrant. Interment will follow in Sacred Heart Cemetery. In lieu of flowers, memorials may be made to the Charleroi Education Foundation, P.O. Box 382, Charleroi, PA 15022.